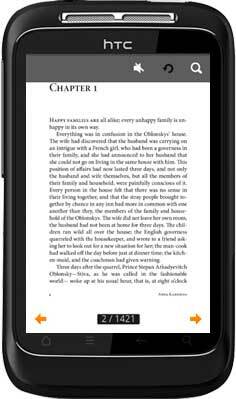 As you see, this Anna-Karenina app for Android joins the previous part of Anna Karenina, in the same way provides the rest of Anna Karenina. You know this book is a classic work worldwide by Russia writer. 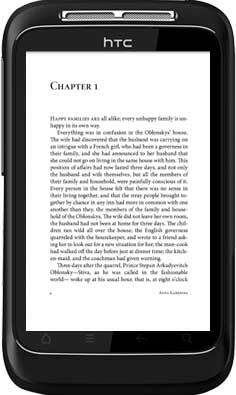 From the fiction, you may find a new world about human beings, life, and anything else? Only if you are enough serious-minded, you would find that maybe others can’t find. 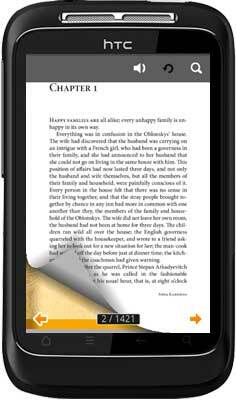 Install it as other Android apps and then flipping like a real paper book. 1. 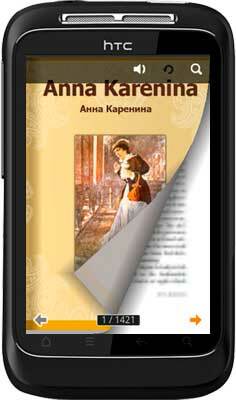 The cover of Anna-Karenina-2, on the top it list flip sound turn on/off button and search function icon. 2. Chapter 1 right page-flipping effect. 3. Notice the top sound icon, this illustration show it off that you can't listen the flipping sound any more. If you need it, you can click it to open. 4. Fullscreen mode make the whole page shown and hide the other icons.